The year is 2064, and all is not well. A struggling megacorp makes a drastic decision to stave off impending doom. A psycholpathic artificial intelligence thought to be dead rises again, attempting to take over the entire Matrix. And behind the scenes, apocalyptic terrorists prepare to strike at key points around the world, completing their first steps towards a vision of Armageddon. Across the globe, shadowrunners find themselves caught up in these events - how will their actions impact the Sixth World? 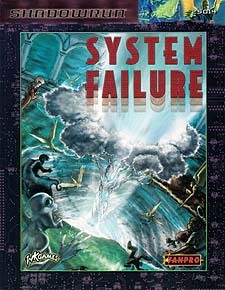 System Failure details the events leading up to and following these dramatic, world-shaking events. In addition to in-depth treatments of the three main plot lines and adventure frameworks for involving the runners in each, it also details numerous aftershocks and spin-off events, with scenario suggestions for how runners can play a role in the years to come. For use with Shadowrun.